Home Stephanie Smith This Desperate Mother Spends All Night On The Internet While Her Baby Lays In A Sink. What A Story! This Desperate Mother Spends All Night On The Internet While Her Baby Lays In A Sink. What A Story! Stephanie Smith, 35, has a little son named Isaiah.When the little boy was born, she couldn’t be happier. When she noticed something strange on her baby’s skin, the tiny baby’s life transforms into a nightmare. However, relief finally came when Stephanie followed her instincts. Isaiah first started having flare-ups at three months of age when he developed a rash that became red and raw when he was exposed to perfume or other heavy scents, like fabric softener. Stephanie Smith took her son, Isaiah, to dozens of doctors in the effort to find a cure for a skin condition that left him in constant pain. A doctor told Stephanie that Isaiah was suffering from eczema and prescribed a topical steroid. Though the rash went away briefly, it soon returned, requiring the use of more steroids to treat it. The rashes continued. Isaiah’s hair fell out and he became lethargic. After five months, a particularly bad episode resulted in raw, red lesions that sent Isaiah to the hospital. He was treated more and stronger steroids. His skin cleared up briefly, but 48 hours later, the sores had returned and Isaiah wouldn’t stop screaming. In the effort to provide some relief for Isaiah, Stephanie began to shut out the world. She avoided anyone or anything that could cause infection; she covered his face in surgical gauze and tried to wrap his hands to keep him from scratching in his sleep. 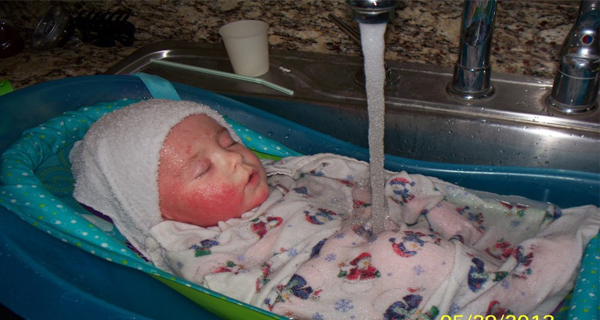 The only time he seemed comfortable was when he was in a bath, so his mother would spend hours with him in the sink, letting the water run over his skin. In the throes of desperation for answers, Stephanie turned to the internet. On a forum about topical steroid withdrawal, Stephanie found pictures of other children with raw, red skin like her son. Stephanie followed her instinct and stopped using steroids to treat Isaiah’s rashes. Instead, she started making her own homeopathic balms, experimenting with different formulations in the effort to find the most effective treatment. “Isaiah would walk to the kitchen island, where I kept the balm, point at the jar and point to his face. It clearly soothed him,” Stephanie told the Mirror. After 10 months of steroidal “withdrawal,” Isaiah’s skin had returned to normal. He is a completely normal 1-year-old. Now Stephanie is using her instinct to help others with skin problems. That is why it is important to SHARE this story with others. Maybe it can help another child and a desperate mother.